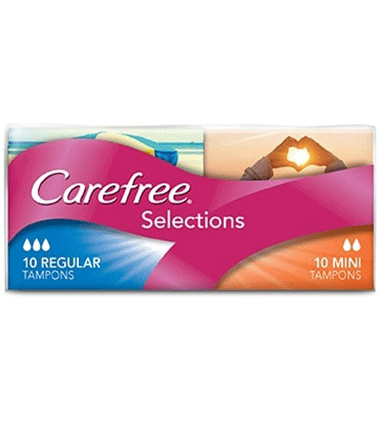 No two periods are the same, which is why we’ve created CAREFREE® Selections. The unique curved groove design of CAREFREE® PROCOMFORT® Mini and CAREFREE® Original Regular Tampons provide reliable protection when you need it most, and Anti-Fluff® technology gives you a smooth surface so that you don’t have to stress about fluff. Each packet comes with both Mini (a drop absorbency rating of 2, suitable for light flow) and Regular (a drop absorbency rating of 3, suitable for medium flow) tampons. Sit or stand in a comfortable position. Many girls prefer to sit over the toilet. Remove the tampon from the wrapper. Hold the tampon at the string end making sure the string is pointing away from your body. Gently slide the tampon in as far as it will go using your index finger. Slant it towards your lower back rather than directly upwards. Remove the used tampon by feeling around for the string and gently pulling on it. Dispose of the used tampon by rolling it in paper and disposing of it in the bin. Never flush a tampon down the toilet. You should change your tampon 3-6 times a day depending on your own individual needs. Also, a tampon should not be left in for more than 8 hours. We recommend to use the lowest absorbency tampon to suit your level of flow and for your own comfort.